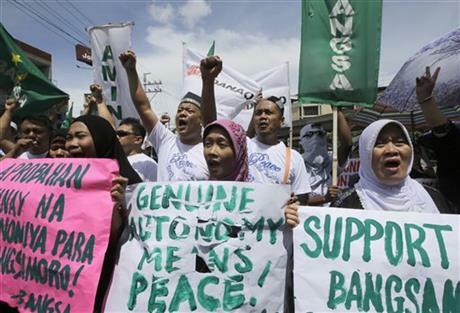 MANILA, Philippines (AP) — The president of the overwhelmingly Catholic Philippines proposed Wednesday to give Muslims in the south the ability to run their own government under their own flag, part of a peace plan aimed at ending a four-decade rebellion that has killed 150,000 people. The Philippine autonomy bill is expected to come under intense scrutiny in Congress, but it is eventually expected to pass given that both the Senate and House of Representatives are dominated by Aquino’s allies. The bill may face legal challenges from Christian politicians and groups, which are wary of ceding territory, power and influence to Muslims. In 2008, the government and the rebels were close to signing a preliminary peace deal but Christian politicians questioned the legality of the pact, which eventually fell apart, igniting rebel attacks. Fighting resumed, killing scores of people and displacing tens of thousands of villagers. Filipinos have grown exasperated with the fighting in the south, so some politicians are reluctant to be seen opposing the plan, said Ramon Casiple, head of the independent Institute for Political and Electoral Reform. This entry was posted in Politics, Religion on Nov 19, 2014 by Editorial Team.